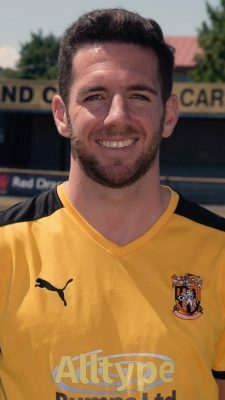 Ian Draycott’s man of the match performance and hat-trick in last weekend’s 6-2 goal romp against Merstham took him to within 13 goals of a Folkestone Invicta goalscoring record – and if he could set that this season it would surely be a sign that his side had a tremendous campaign! The target is club legend Jimmy Dryden’s 141 in 410 games though JD often played wide left, or anywhere else he was asked – including in goal – during a couple of memorable spells at the Fullicks Stadium either side of the Milliennium. But it the quiet and unassuming Draycott bags another dozen or so more, it would surely mean that this free-scoring Folkestone side will end up with plenty! Draycott – who was handed the chance to play up front after being used primarily in midfield in the latter days of his spells at both Maidstone United and Leatherhead before joining Invicta – has twice won the Isthmian League South Golden Boot and even in this injury-hit campaign already has seven goals to his name. He also appears to be the club’s chosen penalty-taker after a poor run from the spot by team-mate Ade Yusuff. Now married to Nicola with one young son, Charlie, Draycs is a popular member of Neil Cugley’s squad and a model professional, never complaining about having to spend some time on the bench though often making an impact later in games. Indications are though the he will be in an unchanged starting 11 on Saturday at Haringey Borough in North London. Borough are making a good fist of their first season in the Bostik Premier and currently sit seventh in the table after appearing on TV in the FA Cup where only a late goal from League side AFC Wimbledon put them out of the competition. This entry was posted	on Wednesday, December 5th, 2018 at 10:30 am	and is filed under Football, Non-League Football. You can follow any responses to this entry through the RSS 2.0 feed. Both comments and pings are currently closed.